Asbestos is a mineral that is mined from deposits found all over the world including the U.S., Canada, South Africa, Australia, and the former Soviet Union. Asbestos is the term given to a group of naturally occurring fibrous varieties of a number of silicate minterals. Asbestos types occur within two groups of minerals: the serpentine minerals and the amphibole minerals. Chrysotile (white asbestos), which accounted for approximately 95% of the asbestos used in the US production of asbestos products, and is the only member of the serpentine group of minerals. Crocidolite (blue asbestos), amosite, (brown asbestos), anthophyllite, tremolite and actinolite asbestos are all members of the amphibole group. Of the six types of asbestos, only chrysotile, amosite, crocidolite and to a lesser extent anthophyllite are mined for commercial use. Tremolite and actinolite have not been mined commercially although can be found as impurities in other commercially available mineral products. The primary useful physical properties of asbestos is its thermal stability and resistance, chemical resistance, high tensile strength, abrasion resistance, low electrical and thermal conductivity, low biodegradability and good sound absorption qualities. The presence of asbestos in commercial products varies depending upon the products uses. While all forms of asbestos are fibrous silicates, they differ in their chemical composition and properties, crystalline structure and fibre dimensions and as such, their commercially useful properties also vary. All asbestos types are excellent thermal insulators and have been widely used in fire proofing and thermal system insulation materials, such as on steel structural beams, furnaces, heating ducting, steam and hot water pipes. The amphibole group has considerable resistance to chemical corrosion, and subsequently has been used in environments that are prone to attack by acids. Both chrysotile and crocidolite have high tensile strength and as such have been widely used in the manufacture of woven asbestos products. All asbestos containing materials are considered to be a potential hazard to health and life. Asbestos is listed and regulated by the federal government as a toxin and is a known carcinogen. All forms of asbestos containing materials can be broadly divided into the following two groups: friable and non-friable. Friability refers to the potential for the material to release asbestos fibres in the air. A friable asbestos containing materials is defined as any material that contains asbestos that can be crumbled pulverized or reduced to powder by hand pressure when dry. Friable asbestos contain materials include sprayed asbestos insulation, pipe and boiler insulation and non-bonded asbestos fabric. When used in non-friable asbestos containing materials, the non-friable asbestos materials are relatively difficult to crush or to be damaged by ones hand. Non-friable asbestos containing materials include asbestos cement sheet products, vinyl floor tile, electrical switchboards etc. In general, friable asbestos containing materials represent the greatest risk to health and life, due to its ability to become airborne. The type and percentage of the asbestos, and the friability of an asbestos containing material can vary substantially. Therefore there is a large variation in the exposure risks associated with the presence of asbestos containing materials within buildings and the removal/abatement of various asbestos containing materials. Confirmation of the asbestos content and type within a suspect material should only be performed through meticulous and careful analysis by appropriately trained, licensed, and qualified personnel (Such personnel are commonly referred to as environmental / asbestos consultants). Asbestos analysis is usually performed by Polarized Light Microsopy (PLM), which is fast and inexpensive to perform. Confirmation analysis may also be performed by X-Ray diffraction, Transmission Electron Microsopy (TEM) or Scanning Electron Microsocopy (SEM). An important part of the risk assessment associated with asbestos containing materials is the determination of airborne fibre levels. Airborne asbestos fibre monitoring is performed by a technique known as the Membrane Filter Method. A sample of air is collected onto a membrane filter, with subsequent analysis by Phase Contrast Microscopy (PCM). All analytical methods are defined in federal register. 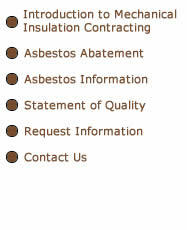 Allied Environmental Services recommends that you choose an asbestos consultant that is licensed by the State of California Division of Occupational Safety and Health. Or if you wish to analyze your own samples, AES recommends that you use an accredited laboratory that employs EPA/NIOSH methods and who participate in QA/QC programs. However, the more definitive method is Transmission Electron Microscopy (TEM). However, asbestos related diseases do not appear for a long time following exposure.